I can be pretty sure that almost all the times we hear the word Agile our mind relates that to the Agile software development process rather than the English word agile. Even Google thinks so. 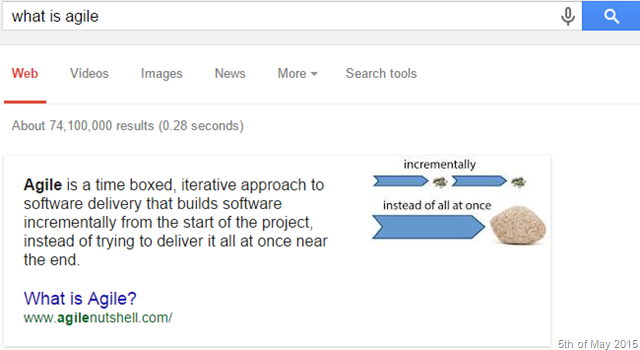 True enough that the semantic of the English word agile is they key to name the so called process as agile. The reason I gave such an introduction to the agile is to bring out how much popularity the process has gained overtime. There’re different ways to implement agile, I don’t know any of them properly by the rules. But I have an understanding that the core of the agile is iterative thinking in an incremental delivery mode. That’s the key rest is how you do that. Thinking about the current software delivery, the process of agile and how it evolved from the well blamed waterfall model, I felt little happy about myself for knowing some old school stuff. I think I was lucky enough to work with computers with huge keyboards which make sound of a shutting clam with green monochrome screens. They used to run the so called DOS 6.2. I have written programs in GW Basic and FoxPro and used 5 1/2 inch floppy disks. Software used to be developed and delivered totally different in those days. An ISV had to write the software and ship it through some hard media (floppy disks or optical drives) mostly with a serial key for licensing purposes. We couldn’t think of iterative delivery on that model. A huge complex software would have ended up with 100s of CDs delivered to the client every two weeks; probably requiring a delivery service like DHL or FedEx. So the delivery and the development practices were forced to lock up in the boundary of water fall model because frequent deliveries were mostly impossible due technology limitations. And those days most of the software were written for desktop computers. With the time, industry evolved and cloud computing has become the heart and soul of the IT. Software development practices started to change and most of the development occurs for the cloud. Cloud not only facilitates the different licensing models and how organizations manage their resources, cloud also has changed the entire software development process. It brought the trends of continuous delivery, online build automation, continuous integration, cloud source control and much more features which are the core part for the iterative development and agile methodologies. Without those tools and technical processes we cannot think of implementing agile in software development in the modern day. Cloud facilitates the modern Agile Software Development and Dev Ops. Each and every line of change is reflected to the customers in near real time with entire automation. Iterative development is fueled by the fast feedback loops. 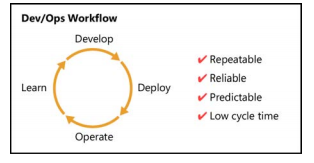 In order to gain the faster feedback loops continuous delivery is vital. Cloud computing facilitates this phenomena. The developer and operations work flow is seamless with the cloud computing. Platforms like Microsoft Azure provides end to end DevOps workflow with tools like Visual Studio online, Azure Web Apps and Application Insights which exactly maps to the above diagram. Cloud not simply a platform it’s the trend setter.